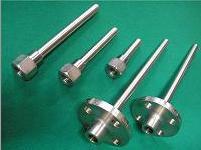 Thermowell (Drilled Bar Stock Type Protection Tube) is usually being used to ensure longer service life under critical conditions such as very corrosive gasses or liquids, high temperature, high pressure, vibration, shock or high flow velocity. Use the compression fitting to fix sheathed thermocouple or RTD. 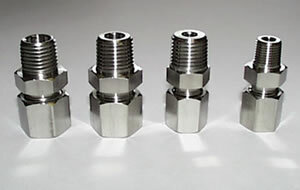 The compression fitting consists of three parts, a compression cap nut, a compression Teflon cotter, and a compression seat.